It has been a long week here, again!! Next week will be better I am sure of it!! 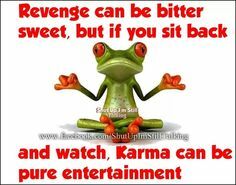 In light of some very funny text messages between a few people I have decided to be like the frog and sit back and watch karma do it's thing!! I am glad I found the clip of Instant Karma, it is worth watching just for Yoko and her eccentricities!! At the end of 52 weeks of hosting this fab linky I am thanking you all for your continued support!! I promise to be over to visit you all this weekend sometime!! Have a fabulous weekend - here's to next week being a ripper! I love karma - especially when I'm around to see it in action, or hear about it. I always choose to do better, be better, treat others better, so when someone we know who is pretty horrible & narcissistic gets a round of karma back on them I'm quietly pleased. Is that mean? Do I deserve some bad juju for doing the happy dance at someone else's come 'uppance?